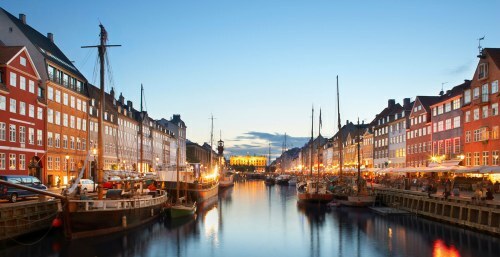 WOW Air is showing winter and spring flights from Toronto to Copenhagen, Denmark for $389 CAD roundtrip including taxes. The actual cost of the 'flight only' is '$229 CAD roundtrip including taxes', but I like to add $160 CAD to WOW Air's roundtrip prices to European cities, which gives you 1 piece of checked luggage, for a more honest representation of the price relative to other airlines. 1 small carry-on, weighing up to 10kg, and a maximum size of 42x32x25cm is included in the 'flight only' price. To book these at a significantly lower price requires booking 2 separate one way flights. You book one flight from Toronto to Europe on the Canadian version of the WOW Air website. And then you book your flight home from Europe to Toronto on the foreign version of the WOW Air website. Make sure that both flights are actually available before you book either one of them. This strategy does involve some risk. If you book the one-way flight to Copenhagen, and then the one-way flight home increases in price in the mean time, you're out of luck. You also need to be comfortable with booking a flight on a version of a website that is not in English. If you try this, you may want to book the flight home first, to make sure you are able to successfully book a flight on the website that is not in English. Booking the flight from Toronto to Europe on the English website will be straight-forward. This strategy may also work for flights from Toronto to Stockholm, Sweden (ARN) - but it seems like the Swedish version of WOW Air's website is currently having technical difficulties. These flights are all currently $99 CAD including taxes. On this international site, we book our one way flight home, in the foreign currency. When you book a flight in a foreign currency using a Canadian credit card, you are typically charged around 2.5% extra, as a foreign exchange fee. I've reflected this in the price above (based on today's exchange rate, 670 Danish Krone really equals about $125 CAD). toronto, yyz, flight deals, copenhagen, denmark, cph and wow air. 10 Responses to "Toronto to Copenhagen, Denmark - $389 CAD roundtrip including taxes"
Checked bags are $67USD PER LEG! Carry on is one item only - so a handbag etc will have to be part of the 11lbs (or 5 kg) you are allowed. You pay for baggage by the leg - i.e. my checked bag was charged $ 67USD to rejkevick and then another $67 from Iceland to Paris. Also be VERY careful when you book you luggage. I booked one bag going from Baltimore to Paris and one going from Paris to Baltimore. Somehow they put both bags on the flight to Paris and none on the way home. Two of us were traveling and I didn't notice the error until the day of our flight (Sunday) when no customer service was available. No one at the airport would help. I was unable to reach customer service by phone - tried 4 times unsuccessfully -and they tried to make me pay again for the bag in Paris when I checked in. By the time you add $320 to your flight (baggage alone) - plus additional service charges..for a low priority seat (ie. middle) Your talking the difference of $50-$200 for a DIRECT flight on a REAL AIRLINE. Alao be aware that WOW will charge for everything, even water. Inhuman business concept but still a good deal if you can stomach it. You can book through google and it will advise to do seperate tickets and set them right up for you through the sites. I.E. wow and expedia for $227 CDN. Update @ 3 PM EST - Looks like all of the Toronto - Copenhagen dates for $99 CAD have sold out except for..
WOW is Not so WOW when you add up all the standard charges they unbundle! In the end you're better off flying with a REAL Airline that has a good reputation!!! Check out WOW reviews on the internet and you know that "you get what you pay for"! Personally I'd stay clear of this Airline! So much hate towards wow every time a deal is posted. This type of airline is not for everyone. If you need the standard stuff, go with a standard airline. There's a reason they are able to offer low prices. Personally I love the fact they unbundle everything. I never check bags and I refuse to even drink water on airplanes (seriously, google that). Always bring your own reservoir and fill up in the terminal. All the bitching and moaning from people who need to be pampered on a flight. Please stay away from Wow so people like me can take advantage of the low costs. And that's the reason that North America will be hard pressed to introduce low cost airlines like those all over Europe. Baggage allowance information quoted above by Jamie is OUTDATED. The weight limit was increased from 5kg to 10kg a couple of months ago.
" Each guest is permitted one piece of carry-on baggage. Included in your airfare is one small carry-on bag up to a maximum of 42x32x25cm / 17x13x10in (10kg/22 lbs) including handles and wheels. In addition to this our guests may board the plane with one small personal item (max 42x20x20cm), such as a laptop, a small purse or camera bag, which must fit under the seat in front of you; and one duty-free shopping bag. " I did my research prior to booking a great deal from YYZ-Berlin during the summer/ high season for 459 CAD all in. The key is being a realistic consumer and setting your expectations accordingly. A duffle bag and a purse is enough for a week's worth of summer touring! In regards to baggage fees, I reached out to the WOW Air regional manager for North America to get some clarification. It can be a little confusing on the WOW Air website. For a regular roundtrip flight from Toronto to Copenhagen, Denmark (without an extended multi-day stopover in Iceland), the total cost of 1 checked bag for the entire roundtrip journey there and back would be $179.98 CAD. The above would also hold true for any WOW Air flights from Toronto to anywhere in Europe when you are not spending time in Iceland, just connecting in Reykjavik through to Europe. For a roundtrip flight from Toronto to Copenhagen, Denmark (or somewhere else in Europe) where you *do* have an extended multi-day stop in Iceland, the total cost of 1 checked bag for the entire journey there and back would be $195.96 CAD. Believe me, I do take these WOW Air bag fees into consideration when deciding whether it's a great deal relative to other airlines, which is why I posted it as being $389 CAD roundtrip instead of the 'flight only' price ($229 CAD roundtrip). It looks like it should have been posted as $409 CAD roundtrip though, as the cost of 1 checked bag for a roundtrip flight is $20 higher than I thought. Thanks for clarifying that Chris, and thanks for this amazing site! No problem Dave, thanks for checking it out!